I SLID QUIETLY INTO THE WATER from the platform at the back of the dive-boat. The 22° water made me shiver as it made its way down the neck of my wetsuit. The water was murky after a recent heavy rainstorm. I hovered for a moment looking around me, then swam gently away from the boat. With only a metre or two of visibility, and remembering the briefing, I moved very slowly and as quietly as possible. A sudden nudge from behind had my heart racing as I span round. There, right up in my face, was a large snuffling nose full of whiskers, and a munching mouth with weed hanging from it. Finning back slightly, I took in my first view of a stocky, strangely shaped body roughly twice my size. As I moved away the creature followed, extending paddle-like fins. I didn’t feel threatened at all; in fact I was enthralled as I stopped moving and allowed it to come close and hug me, snuffling into my hair, which must have looked like blonde seaweed waving around in the water. I was snorkelling with my daughter Camilla in Crystal River, a part of Florida to which manatees are known to escape the cold waters of the Gulf of Mexico during the winter months, keeping warm in the hot springs that flow into the river. 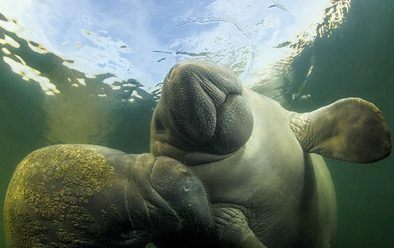 Florida manatees are a subspecies of the West Indian manatee, and were on the Endangered list from the early 1970s, when there were only a few hundred left. After huge conservation efforts the population has now increased to more than 6000, with their status recently downgraded to Threatened. A manatee munches algae off a line – it’s vital to check under boats before moving off whenever possible. Around the Crystal River area, which is on the Gulf Coast 80 miles north of Tampa, signs warn people to take care when boat-handling because of the presence of manatees. The area is very shallow, and manatees need to surface to breathe. In the murk it can be very difficult to see them, despite their size. Unfortunately, many of the mammals have scars from boat propellers. I even saw some with mutilated or missing flippers. Manatees are herbivores and feed on both saltwater and freshwater algae and aquatic plants, needing to consume 10-15% of their body weight daily. They are often seen eating the algae that builds up on the hulls of boats or on mooring-lines, which might also be a factor in why so many are scarred. As careful as people might be with their boats, if a manatee is hidden beneath the hull there is little they can do about it. Adult manatees average around 3.5m in length and weigh 500kg, but can grow to 4.5m and up to 1500kg. At birth, babies measure around 1.2m and weigh 300kg. Female manatees gestate for 13 months before giving birth in the spring or summer. As mammals, babies suckle on their mothers, but can start eating algae from only a couple of weeks old. Manatees are very slow swimmers and need to breathe every 3-5 minutes, although they can go without breathing for up to 20 minutes while sleeping. I looked around and saw that Camilla had been joined by a 1.5m baby manatee that was snuffling against her hand. It was obviously the calf of the large female that had been paying so much attention to my hair, because she lost interest in me and joined Camilla and the baby, rubbing herself up against Camilla’s hand and almost asking to be scratched, while making gentle chirping noises. When socialising or threatened, manatees can be quite vocal. Babies can vocalise from birth. Manatees often have algae growing on their bodies, especially their backs, where their sparse hair is less dense. Their skin, like that of elephants, is very thick and grey. They try to remove the algae by abrasion, so often approach snorkellers for a scratch. I COULD HEAR Camilla laughing into her snorkel as the baby tickled her hand with the whiskers growing from its nose, and saw the smile of pleasure in her eyes that I knew matched my own. Manatees are so gentle and charismatic that you can’t help but be charmed by their goofy expressions and shows of curiosity. We were staying at Plantation on Crystal River, a golf resort in the Kings Bay area. Located on the riverbank, it offers snorkelling tours with the manatees from its own marina. Scuba-diving is not allowed, partly to avoid scaring the manatees, partly to avoid stirring up the silty bottom but mainly because it would be dangerous for the divers, given the shallow water and number of boats. The next day we chose a semi-private tour operated by Plantation for a maximum of six people, though there were only two besides us. The tour costs $99 a head compared to its standard $69 tours for up to 12 snorkellers, but we felt the extra $30 to go with a smaller group would be worth it. All tours run in the mornings between 7-10am, which is when the manatees are the most active. During the afternoon, they seem to rest and sleep on the bottom, venturing to the surface only for a quick breath of air. It can be difficult to spot them on the bottom in the murk, as they are quite well camouflaged there. EVENTUALLY THE MOTHER and calf moved on, and we snorkelled around, looking at other manatees playing together just under the surface. Very social creatures, manatees like to swim together in groups. Around 400 visit the springs, which remain at 22°C year-round, in autumn as the sea cools. 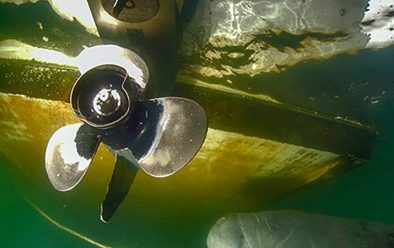 We snorkelled slowly back towards the boat when our time was nearly up, only to see a manatee munching on the mooring-line, just under the propeller. As we climbed aboard we told the boat captain, who made sure to wait for the manatee to move on before starting the boat with the prop in the air. He then very slowly lowered it into the water, to ensure that no other manatees were hidden under the hull. Keen to repeat the experience in what we hoped would be better weather with clearer visibility, we hired kayaks that afternoon and paddled around the area to view the manatees from the surface. We made sure to keep our distance unless the manatees came towards us, as another thorough briefing had instructed us was best practice. One or two manatees approached our kayaks as we rested in the water, paddles up. One popped its head up next to me and snuffled against the hull. It was such a delightful experience, it made me chuckle. THE NEXT DAY we booked onto the semi-private tour again, and this time the boat took us deeper into the maze of rivers to find the source of one of the springs, where the manatees are known to gather. The area is inaccessible to boats, so we were instructed to snorkel up a rocky-bottomed inlet to a slightly deeper bowl, where we could feel the warmer spring-water gushing into the river. The visibility was much better here, and as we entered the bowl we saw snorkellers from other tours crowding around a cordoned-off area in which a large group of manatees rested on the bottom some distance away. No swimming or snorkelling was allowed in the area, which contained some 12 manatees, sleeping on the bottom facing away from us. We watched for a few minutes before moving on. Swimming around the bowl we found small freshwater fish among the boulders, basking in the warm spring waters. It had been an enchanting experience interacting with and watching the friendly manatees, and one we’re keen to repeat. GETTING THERE> Fly direct to Orlando or Tampa airport. A hire car is recommended, or the hotel can arrange a transfer. Crystal River is up to two hours from Orlando or one from Tampa. ACCOMMODATION> Plantation on Crystal River, plantationoncrystalriver.rezdy.com. There are many other hotels and Airbnb options. WHEN TO GO> Manatees arrive at Crystal River from the beginning of October and stay until early April. PRICES> Plantation from £380pp for four nights in October. 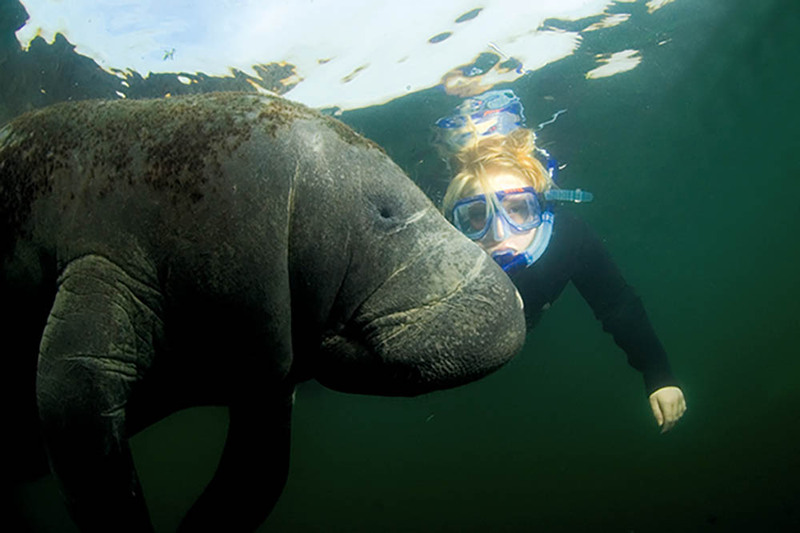 Three-hour manatee snorkelling tour US $65pp, semi-private tour $99pp and private tour for up to six $500. Return flights London to Tampa from £260.